North Georgia Vacation Rental near Blue Ridge, GA and McCaysville, GA. Featured on HGTV`s Log Cabin Living. Perfect location, great amenities, and so much more! This cabin was featured on HGTV`s Log Home Living show. Soak in the hot tub, enjoy the mountain view from the outdoor fireplace, and so much more! This mountain cabin is well appointed sitting close to both Blue Ridge, GA and McCaysville, GA. The rustic yet luxurious cabin was featured on HGTV's "Log Home Living". 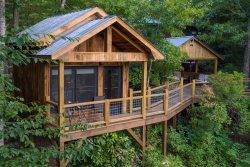 If you are looking to get away and relax or have adventure in the mountains, this is the cabin for you! It is only minutes away from downtown McCaysvile. You are so close to restaurants, shopping, whitewater rafting, and more. This is the perfect "home" to come back to after a day of adventure in the North Georgia mountains. This cabin is minutes from downtown McCaysville, GA and Copperhill,TN. This is a great location to stay if you love white water rafting or tubing the river. You are also just a 15-20 minute drive away from downtown Blue Ridge, GA. This cabin offers the best of both worlds. Enjoy the peace and quiet of the mountains while being close to all the attractions. Bath offers Laundry area, granite counter tops, double vanity, tile shower. Cabin is great. Be sure to check out the external fireplace on the porch!! Only a 20 minute drive to our rafting outfitter and spacious for 7 adults. Amenities, especially the outside fireplace, was enjoyable. Donna was extremely helpful and friendly. The Willow Creek Cabin Rental company was so easy to deal with, always responded immediately to emails, and sent someone out to repair a leak within an hour of my request! Most pleasant experience I have ever encountered with a vacation rental company!!! All Bed Linens and towels are provided with this rental. Kitchen is stocked with utensils, pots, and pans. There are no food items, spices or condiments provided. You will be provided with 10 Kitchen Trash bags, 2 rolls of paper towels per Kitchen Sink, 2 packs of dishwasher detergent, 1 box of single load laundry soap, a small 2 oz bottle of body wash, shampoo, and conditioner per bathroom with tub or shower, and a bar of hand soap per bathroom sink, 2 rolls of toilet paper per toilet. You will also be provided with a souvenir Willow Creek Cabin Rentals tote bag to take with you.